"The view from the garden is stunning and the beach 2 km away..."
Have a question for Brise de Kep Boutique? Whether you're a tourist or traveling on business, Brise de Kep Boutique is a great choice for accommodation when visiting Kep. From here, guests can enjoy easy access to all that the lively city has to offer. With the city's main attractions such as Koh Tunsay Pier, Kep Market, Sok Morn Palace within close reach, visitors to the hotel will just love its location. At Brise de Kep Boutique, every effort is made to make guests feel comfortable. To do so, the hotel provides the best in services and amenities. To name a few of the hotel's facilities, there are free Wi-Fi in all rooms, Wi-Fi in public areas, car park, family room, car hire. Guests can choose from 7 rooms, all of which exude an atmosphere of total peace and harmony. Throughout the day you can enjoy the relaxing atmosphere of the private beach, massage, garden. 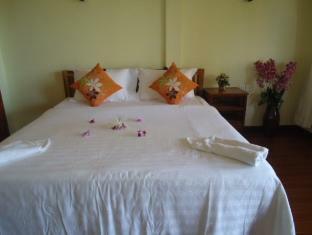 Whatever your purpose of visit, Brise de Kep Boutique is an excellent choice for your stay in Kep. "If hotel have place for children playing is more wonderful." The photographs look good, but it the room and surrounding grounds were very average. Very little english speaking staff. I booked a seaview but not given this room, I really had to demand this and eventually they gave me the room that I had booked. I would not stay their again. It was too noisy since it is so close to the sea. You can hear the boat engine and that does disturb the sleep. From my experience the service was hardly existing. There was nobody at the reception. They did not even know that we did a reservation through agora and they kept asking us what was the rate we paid. You need a tuk tuk or motorbike to get to the hotel (it is quite far from the center) and they charge a lot for a motorbike moreover the people who rent the motorbikes happen to be quite rude. Everything is good only one thing that the pressure of water in bathroom must make more strongly. If hotel have place for children playing is more wonderful. We will come back! The rooms are spacious and clean, the staff is kind, but irregular, sometimes the rooms were not cleaned and breakfast was not served completely. The restaurant is closed, but there are others nearby. The view from the garden is stunning and the beach 2 km away. You can swim at the shore. but the facilities are not great. The atmosphere: The beach. The tropical trees the beds an the coast. Wonderful!!! The first night was just me and my friend it was so peaceful. The second night there was a party. The people were very nice. We booked the hotel based on Agoda review, but it turns out way better than we expected! My wife and I had a wonderful time there! Included the most friendly hotel manager! Highly recommend for beach and peaceful place lover! A clean place located, where the boats leave for rabbit Island. The staff organized boat tickets and a taxi to Phnom Penn. The English skills of the staff could be better to avoid some misunderstandings. The tuktuk Driver they organized in the evening to go to the old market had a good Price and was back in time to drive us back. 1. The staff is super nice & accommodating especially the gentleman running the bar/hotel:) 2. location 3. Breakfast. this hotel is small and located away from the centre ideal for those who like the quiet life. the food is very good and the staff very friendly and sea views great. one word of warning avoid Kampot tours for any transport arrangements to continue your travels check the internet fro what they do to people. There was a problem with the airconditioner on the day I checked in, which they couldn't resolve without calling external help which came in on the next day and fixed the coolant. Staff were friendly and did their best to help though. Other than aircon problems, Room wise was comfortable and decent. Atmosphere of the resort was pleasant and relaxing. Had dinner here and the food was superb! It's next to the pier where boats depart for Rabbit Island, but a distance from the main city area (approximately 20+mins walk). If you are looking for a couple of days of rest and away from it all,this might be the place.The beach in front of hotel is too shallow,seawater not very clean...Kep is a spread out place,need scooter,bike or tuk-tuk to get around,not much happening,except the few hang outs near crab market!Hotel a bit overpriced for what you get!Visit rabbit island for some real relaxed atmosphere! lovely place to stay and relax, nothing to do but sit in the garden, laze in a hammock and watch the sea. Location is ideal for a trip to Rabbit island. Hotel staff will book a tuk tuk if you want to go to the crab market which is about 5 km away along a very dark road. The manager was professional and helpful. The cleaning crew enter our room without our permission , pretended not to understand a word of English . Couldn't get shampoo for 2days Noisy construction next door.